We have all heard it before. We should be respectful of culture – that very illusive, nebulous but extremely powerful thing that dictates the way that things get done in every organisation or group – else we won’t succeed. Unlike rules, regulations, strategies, working practices, processes and procedures, culture is mostly invisible. This characteristic is particularly daunting for anyone who has ever attempted to implement changes to an organisation or group. How can you change or even acknowledge what you can’t see, touch or feel? Shouldn’t out of sight be out of mind? Is culture then, overrated? An acquaintance recently offered a very logical argument. According to him, in the current unstable business environment where businesses fight to survive, where the customer demands more and should get more and where employees look to their leaders to do whatever is necessary to keep their jobs afloat, there is no room to “pander to the whims of culture”. This, he says, is “common sense” – especially as we approach the very uncertain post Brexit era in the UK. Leaders owe it to their staff, shareholders and stakeholders to deliver and implement the necessary changes to transform their business’ health – as a matter of priority. When this happens, he says, culture has no choice but to quickly catch-up with the change and adapt. ….what the symbols tell us about where the power and influence within the organisation or group lie. The total of these clues and others, give an indication to the culture, behaviours and what is revered and what is not. No matter how hard the trading climate or how urgent the need for change, these cultural elements are generally immune to outward pressures for change and a change leader will do well to take notice and tread carefully. Case in point is the lovely recent incident that I have affectionately christened Southern Railway v. “A Very Stubborn Swan”. Southern Railway is a train passenger carrier business within the Govia Thameslink Railway (GTR) family. GTR has had a particularly challenging trading climate of late including various crippling union strikes in 2017 (in protest against the introduction of new working practices enabled by technology ), which particularly impacted the Southern railway business operations. This year, GTR again suffered severe train cancellations and disruptions . This time it was as a result of new radical timetable changes on the rail network which did not go as planned. Both changes have resulted in significant untold hardships to GTR’s passengers, employees, stakeholders, reputation and finances. GTR is no doubt more than relieved to get their businesses back on track again with uninterrupted train services. An obstacle on the train line, in the shape of “a very stubborn swan” , is therefore not a welcome sight and not part of the plan. Said swan however wasn’t going to bow to any pressure, and inspite of repeated attempts by a Southern railway employee to gently encourage it to move away, it refused to budge. 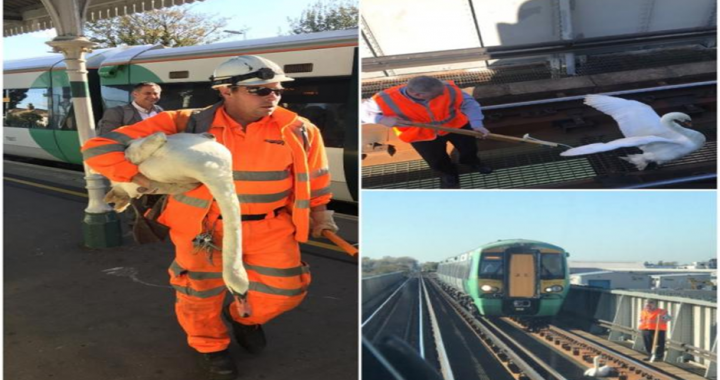 As this is the UK, where the routine is to respect the welfare of animals (no matter how stubborn), and where stories abound of the significant power and influence that symbolisms such as animal welfare organisations have over people who harm our non-human friends, Southern railway’s train driver had to bow to culture and wait patiently for the swan to move. Trains were cancelled, journeys were delayed and several hundred passengers were stranded. All because of a swan! I don’t know how much commercial damage would have been done, but suffice it to say, it would have done enough. I told the swan story to a Nigerian relative and they scoffed. “You British are weird”, he said. “If it were in Nigeria, that swan would be suya (a spicy skewered meat delicacy)! No swan is worth the disruption or loss of money on such a scale”. For me, that illustrates the unwritten rule and differences in culture and cultural practices. If the swan had been harmed in the UK, there would have been uproar not least from the very passengers that the train driver was trying to serve. This, in turn would have resulted in significant reputational damage to Southern Railway and GTR which would ultimately transfer to financial damage. So, is the culture of an organisation overrated and irrelevant in today’s climate? I say no. Culture continues to trump customer service, financial pressure and yes, common sense and should be handled strategically ….and with care.